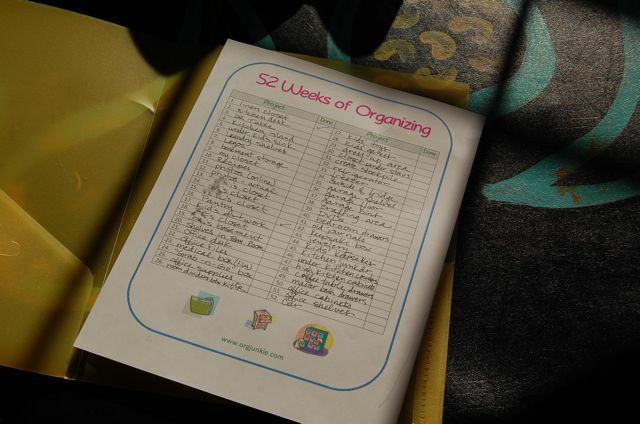 To participate, all I had to do was create a list of 52 organizing projects or habits that need to be done or developed around my home, and then tackle one project per week for the year. Piece of cake… creating the list, that is. I could think of 52 things that needed to change just in the room where I am sitting right now! So I made my list and got started! If this sounds like a cool idea to you, it’s never too late to get started. You can get a free copy of this cute list at orgjunkie.com. Kitchen Sink Window Sill Dumping Ground... BEFORE. Oh yeah. Soak it in. What a visual cornucopia of CRAP. Just in case you can’t really make out all the fascinating goodies that have been randomly dumped here over the past few months, let me just point out some of the highlights for your viewing pleasure. EXHIBIT A: coupons, Thanksgiving turkey wishbone, one slutty Barbie shoe, an empty baggie, and a soap carving. Perhaps we would have remembered to break the Thanksgiving wish bone if it hadn’t gotten buried behind so much other crap. 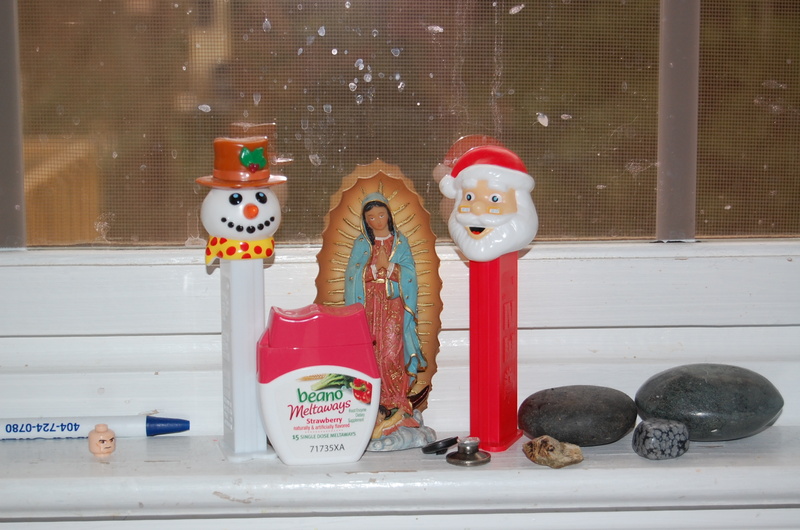 EXHIBIT B: Christmas Pez Dispensers flanking Our Lady of Guadalupe and some Beano Meltaways, plus some rocks, two buttons, a frowning Lego head, and a pen. HOLY CRAP. 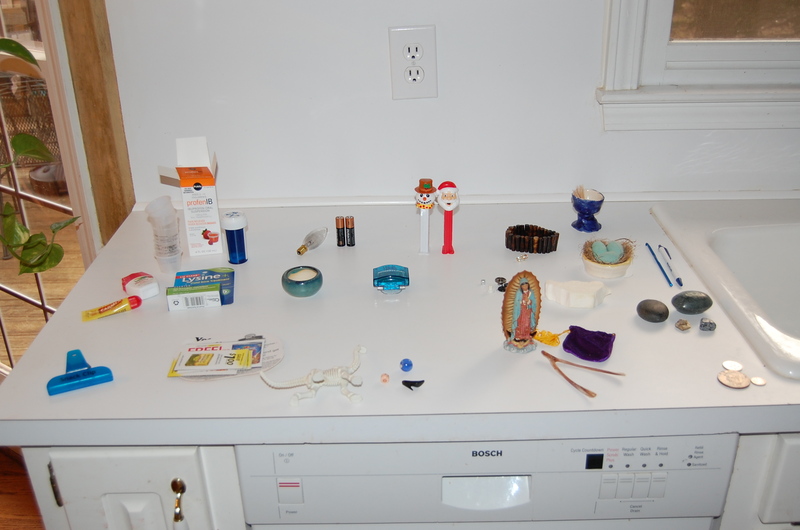 EXHIBIT C: 8 OTC medicine cups, Carmex, a burned out lightbulb in a votive candle holder, two batteries, and my dog's antibiotics for some nasty skin infection he probably got from one of my kids. And there was more random stuff… some jewelery (Fair Trade! ), some rogue coins, a Tooth Fairy Bag. You get the point… this is a dumping ground for lots of small things. Have I mentioned that I have a dog with an eating disorder and a very mischievous 3 year old son who likes to stick things in my computer ports? Also, I’m a bit on the lazy side. There, I said it. 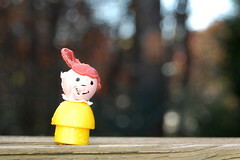 Plan – yep, got one: gonna put my sh*t away and try not to let it get like this again. Remove items – easy. Just moved it all to the counter below the sink and to the left. Organize/Sort/Purge – this is the step I always get stuck on. If I knew how to purge, I wouldn’t have spaces like this in my house, now would I? But enough with the excuses already. 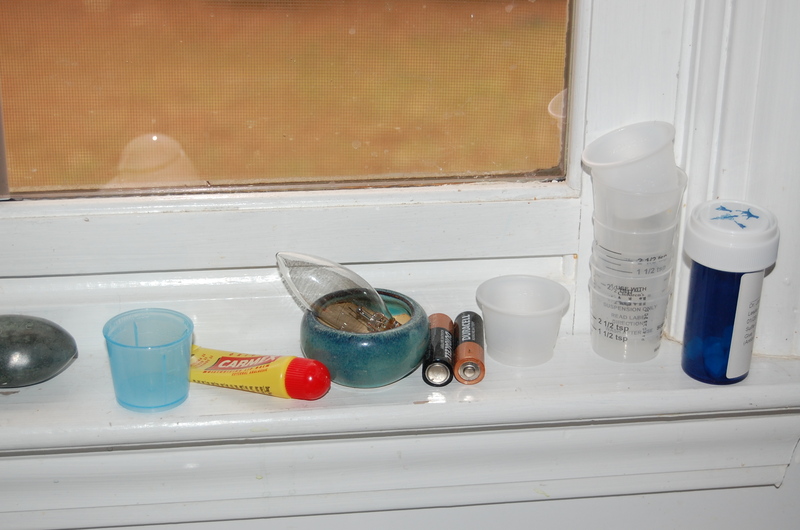 I divided all the stuff I removed from the window sill into piles: like with like. Sorting, purging, putting things where they belong. Then I put on some KC and the Sunshine Band and shook shook shook my booty as I ran around and put things away where they really belonged. Did I actually purge anything? Yes indeedy! I got rid of 7/8ths of those old medicine cups and the burned out light bulb. Big whoopdie-do. Everything else had real homes though. Next step – containerize. Didn’t really need to do that here. Next! Evaluate plan? Okay. Now here is where I had my big AHA moment. 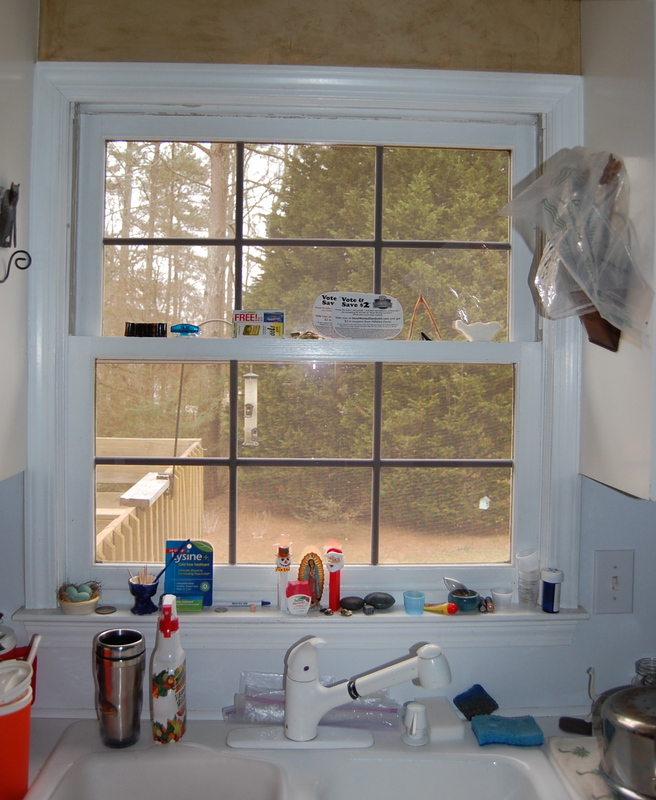 I bet I’ve been cleaning this kitchen sink window sill off every two months or so since we moved in 7 years ago. But it always seems to go back to being a dumping ground, so how could I end this cycle and keep it clean once and for all? So I started doing the Org Junkie “10 minute tidy” at the end of each day, paying special attention to the window sill. I found myself policing that sucker like a new mother protecting her two day old panda cub. Every time my husband would put something there, I would be there like white on rice to say “Um, excuse me, but where does this really belong?” It was incredible. What a shift in thinking. Maintaining this little space everyday was surprisingly easy once all the clutter was gone! Solve and simplify? Yes and yes. The simplifying was my favorite part. By removing all the clutter and putting away all the things that had real homes, I could decorate the space with the one or two things that REALLY matter to me, like my Blessed Lady of Guadalupe statue and a rock my friend gave my daughter that says “love.” I could also easily clean all the water spots off the window. Bonus! But the solving was an important key as well. I created a “coupon bag” to hang on the fridge as a catch all for coupons that my husband and I cut out on the fly. 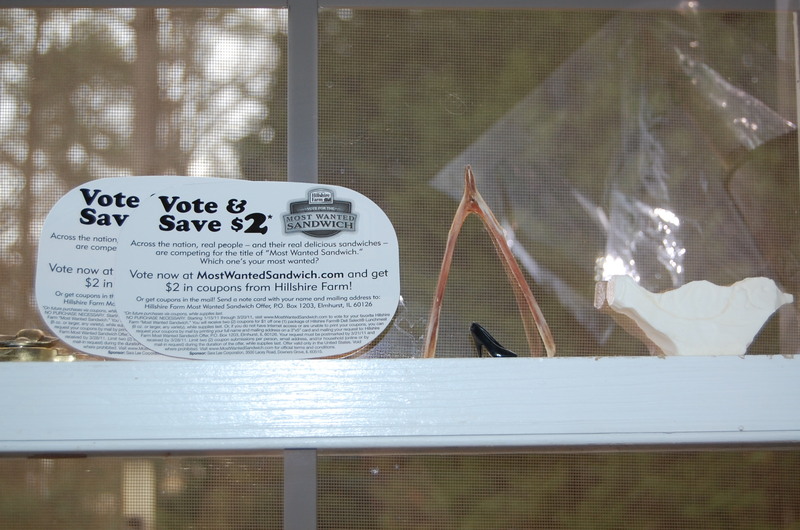 Now there is a real home for coupons and they won’t end up on the window sill. 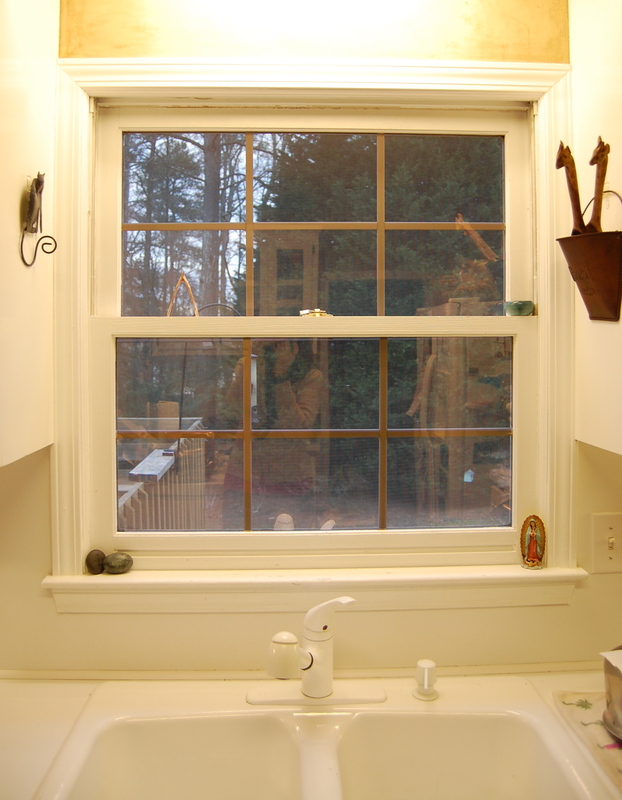 Kitchen Window Sill Makeover, 8 days later! And THAT, my friends, is how a lazy mama like me changes a habit in 8 short days! Let’s just compare that before and after again, shall we? Well, that’s one more thing to cross of my list! Yeee-haw! Tune in next Friday to see if I can keep this motivation going and tackle my desk. 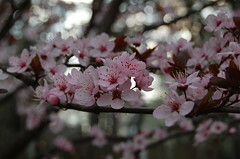 I’ll also keep you posted about my progress with changing my habits and keeping the clutter at bay. Off to do my 10 minute tidy! My kitchen window is quite similar- I have a collection of Lego minifigures guarding my Christmas cactus plant and quite a few other “trinkets” that need a permanent home…. Maybe today I will attack the window… however- there is a junk drawer with my name on it…. Maybe I’ll go watch Oprah. Oh- and no blaming your husband for the flatulence… Girl, I know it was you. Okay, fine. I cannot tell a lie. We both use the Beano. And it totally doesn’t work. See… pull my finger! Good job! And I must admit, I’m liking the cleared off counter too. I’m totally envious. Right now my counters are full of stuff. I’ve just had other priorities the last few days. Rearranging furniture and resting my ankle (that I’m still supposed to have my air cast on – and using my crutches for – my bad). Kinda sounds like opposites there, eh? But in all honesty, I just directed the furniture mover (aka Hubby) and sat on the floor going through stuff that was left in his wake. There will be a post later today with the progress. 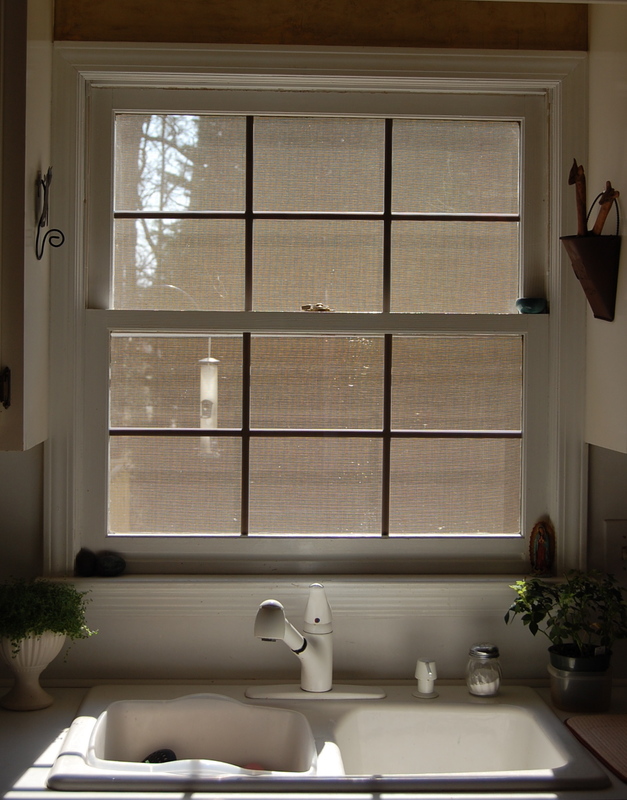 OK, you have motivated me to add my kitchen window sill to my list. After reading your post and looking at my sill I realized it needed help bad. Thanks for sharing. Thanks for stopping by, Alexandra! Yes, it is incredible how quickly we get used to the clutter and don’t even notice it anymore, isn’t it?! It feels SO much better to spend time at my sink now (as if…). OMGosh if you were not so much younger than me, I would swear you are my long last twin! I did my window sill before the project started. I use the little plastic medicines things for bread closer things that I saw someone use to label their computer plugs to identify them! I need to put a few things away on mine. You are hilarious! You descriptive writing cracked me up! Way to get all that sh*t off you windowsill. Happy Organizing! i won, i won, i won!!! my rock made the cut!!!!! i have a sink window disaster of my own. but i’m worried I’d be even MORE bored washing dishes without the doo-dads? Your windowsill looks great! Clutter gathers throughout my kitchen as well. I think the hardest clutter is that clutter that you don’t want to get rid of but doesn’t really have a space to live clutter. I think it’s good that you designated a spot for the coupons – that is a good idea for me. This entry was posted on February 18, 2011 by Leslie Marinelli in organized and tagged clutter hot spots, how to organize using the PROCESS, organizing, reduce your kitchen clutter.